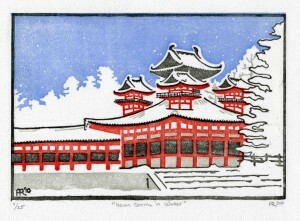 My latest print, “Heian Shrine in Winter,” turned out to be an exercise in the use of white space. In this four-color print, I have tried to use the uncolored portions of the page to indicate snow. It was a very obvious choice to go with snow, I know, but the exercise was successful in creating an aesthetic composition. Hopefully I will be forgiven. 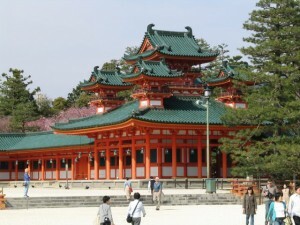 The Heian Shrine is a shinto shrine in Kyoto, Japan. The Soryu-ro, built in 1894, is a multicolored hall within the shrine complex complete with tall lookout towers. This is the building I depicted in my print. For more information or to purchase this print, click here.